The number — 4:40 — looked like it belonged with a Bible verse. It bounced above Erica Ferrell, attached to a long stick, as she toted that sign through Columbia Heights, NoMa, Capitol Hill and Anacostia, her disciples followed. In the end, her message was indeed the truth. She crossed the line at the Rock ‘n’ Roll USA Marathon in 4:40:06, right on schedule. Least she seem uncompassionate, it wasn’t Farrell’s job to hold her runners’ hands for 26.2 miles. She worked in some flexibility in her pacing for hydration, but she was to be the metronome that runners would be able to look to for consistency. Pacing groups are marathon mainstays, and crucial for many novice marathoners to complete the race. Among the string of solitary runners, they pack up and their dozens of footsteps announce their presence. Spectators use them as reference points when trying to locate friends and family members in the middle of the race. Ferrell, a Thurmont, Md. resident came to the job at the behest of Nate Nudelman, coach of the Navy Academy Marathon Team. He has a core group of pacers that have worked the Rock ‘n’ Roll USA Marathon and Half Marathon and its previous incantation as the National Marathon, a crew he supplements with Midshipmen who cut their spring breaks short to come and pace. For Ferrell, a 3:40 marathoner who has run more than a dozen and qualified for Boston at the California International Marathon (with the help of a pacing group), it was a chance to give back. A four-hour marathon is pretty comfortable for her, so Nudelman’s initial assignment, for her to lead the 4:25 group, seemed like no sweat. When he moved her back to 4:40, she was a little concerned. Sure enough, she started out a little fast, just a few seconds per mile, but a few of her runners let her hear about it. That banked time came in handy when the group hit mile seven’s uphill on Shorham Drive, climbing out of Rock Creek Park into Woodley Park. Running the hill can throw runners’ confidence askew, but Ferrell’s instructions aimed at defraying the curveball the incline threw at any attempts at an even pace. It turns out the time the group had sped up early on was closely offset by the climb. When they hit the top, they had broken even. Not bad for someone who had never run the course before. She ran with a Garmin watch to aid her pacing, but rarely consulted it. The Rock ‘n’ Roll USA Marathon sets the pacing group target times based on the historical demand for pacers throughout the entire Rock ‘n’ Roll Marathon series. This year’s Rock ‘n’ Roll USA paces included 3:10, 3:30, 3:40, 3:55, 4:00, 4:10, 4:25, 4:40 and 5:00. The accompanying half marathon has 1:45, 2:00, 2:15, 2:30, 2:45 and 3:00 pace groups. When the course flattened out in the second half, Ferrell saw her runners lock into a consistent pace, but she lost her pacing partner to injury. At the same time, some of her runners were also starting to tire and she saw herself as much a cheerleader as a pacer. Her secret weapon at that point was distraction. 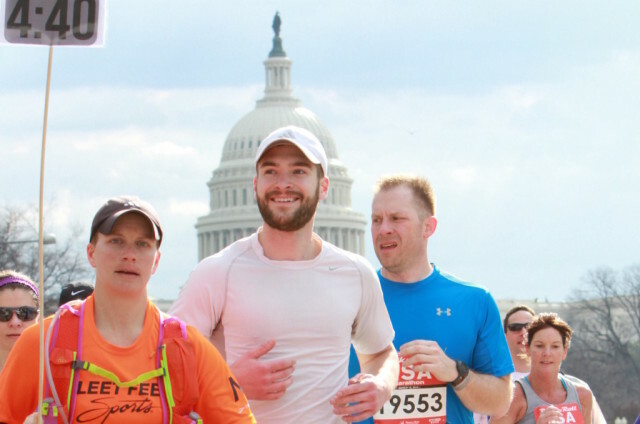 She is considering running other races as a special needs guide, such as with the visually impaired runners at the Woodrow Wilson Bridge Half Marathon. Ferrell made her own marathon debut in Portland, Ore. while her now-husband was deployed and she, then a military police officer in the U.S. Army, was looking for something to do. Because the train doesn’t wait.